Check Out This DIY Ring Keeper I Made Out of Clay! Check Out What I Did This Weekend…I Made This DIY Ring Keeper From Clay! Make This DIY Ring Keeper Today and Get Organized! Once again welcome to my latest art project adventure – this diy ring keeper that you can make yourself, that only needs a few materials! Are your cute fashion rings all over the place and you need some way to get ’em together -and in a most creative way? 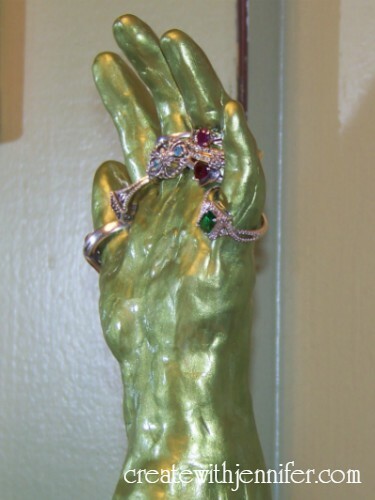 A few years ago I made a diy ring display piece in the shape of a human hand (after seeing one too many of those plastic jewelry store versions) from Sculpey and gave it to my brother in law’s girlfriend for Christmas, she liked it and probably wasn’t expecting something like this. So I was wanting to make another one, this time for myself, because, well, I’ve been keeping my fashion ring collection stored in an ice cube tray (that’s a neat hack btw) in a drawer but I just wanted something more, to show them off, and make them easier to get to when I need to find just the right ring(s) for the right occasion. Here she is, she took about 3 days tops, and here are the materials I used below. To do this DIY ring keeper all you need is some oven bake polymer craft clay, acrylic paint, and a good idea of what kind of figure you’d like to sculpt. Also nice, but not necessary would be some sculpting tools to help with finer detail and smoothing the clay down as you work. Yes you too can make your own ring holder following my guidelines above and using the same ingredients. i think the hand is a great design and my favorite; as it lets me spread my collection out more . Saguerro cactus – Multiple “branches” (is that the right word?) could easily hold multple ring sets. Two bunny rabbits – Give them longish pointy ears to loop your rings on-that would be adorable! Eiffel Tower – Anything with the Eiffel Tower in anything is sure to be a great conversation piece. Kitty cat – Or make 2 kitty cats and have 2 tails for your ring stacks, better yet. I used the original Sculpey as the first two I used the Ultra Light and even though I love that one too I felt like it was a little too soft and I wanted this diy ring holder display to be strong enough that it couldn’t get tipped over easily. You could also create a round base for the object of choice to rest on and this can give some extra space to drop additional rings too! 2. Bake your soft sculpture as per directions which should be 275 degrees F for about 20 minutes. Let it cool; it will be hot to the touch for awhile and you may want to put off painting or glazing your finished piece for a few hours. 3. Paint it as desired in whatever colors you desire most…After baking it in the oven per usual my routine I started the painting – I gave it 2 coats of Folk Art paint, in the color named “Peridot” which I chose because I love any shade of green that’s in the springy tone family. (Isn’t Peridot August’s birthstone too btw??) It looks like a nice green with gold undertones. 4. Varnish when thoroughly dry; you want to preserve it well so it can stand up to prolonged use. You can also apply sealant instead. The first time I made this thing I felt like Mod Podge left it with a sticky feeling so I just use the spray on sealant. 5. 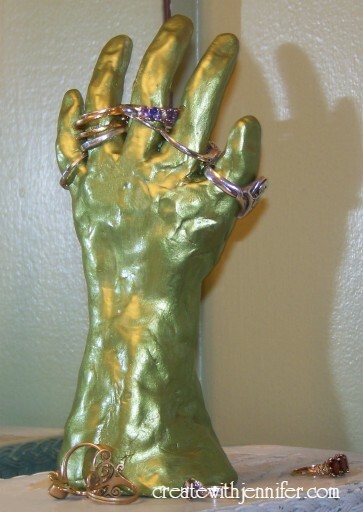 Let it “cure up” for a few days before you use your cute new diy ring display piece! I’ve been binge-crafting lately and sometimes I want to go back and do repros of things I have made before that I either gave away as gifts or otherwise, enjoyed. It probably took me about half an hour to make the hand out of the soft clay product. Well I did have some practice beforehand! It is doing what it was designed to do, keep my rings in one place. I have all kinds of rings and I liked the hand design best because I don’t want them all bunched up together which might be the case with the kitty cat tail or Eiffel Tower. That is so cool! How fun and creative! I love how easy it seems! Thanks! I saw another method for this on another site, that involved taking a latex glove and filling it up with liquid plaster of paris and letting it set up then cutting away the glove to reveal the perfect hand shape. I passed it one because I never use molds to make anything I do as I feel that it keeps your work from being truly “one of a kind”. Oh wow, great work! This makes for a really pretty and unique decoration and it will be nice to have all the rings in one place. 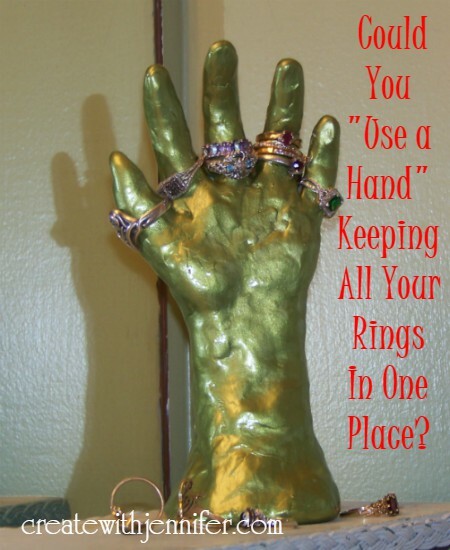 What a great DIY ring holder! The hand could also double as a Halloween decoration! I take my rings off everynight, even though everyone tells me it’s strange. Anyway, this would be great for me. How creative! I wish I had at least a fourth of your talent. I am handy with tools but I don’t do well with crafts like that. That ring holder is so unique and I can’t believe it is easy to make. I will show this post with my niece. She will love to work on something like that. love the color looks as if it may belong in a haunting place or something.